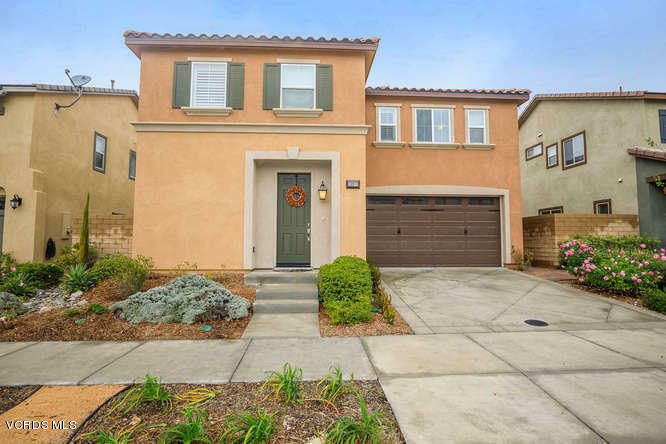 Welcome to this gorgeous 4 bedroom, 3 bathroom, 2385 sqft home built in 2015 in the desirable Living Smart neighborhood of Moorpark Highlands! Step into a welcoming home with a large carpeted living space, cool modern paint tones, and plantation shutters throughout the house. The gourmet kitchen has granite counters, stainless steel appliances, dark wood cabinets, center island, pantry, and large area for your dining table. The desirable floorplan has a downstairs bedroom plus full bathroom. Upstairs is a spacious loft area, and laundry room with sink, cabinets, and lots of room for folding clothes. The master bedroom has a huge walk in closet, and the spa like master bath has double sinks, large soaking tub, and glass enclosed shower. There are 2 nice-sized secondary bedrooms with walk in closets. Hall bath has double sinks with quartz countertops and a tub/shower combo. The private backyard has a beautiful paver patio and new landscaping, making a perfect relaxing space for outdoor dining! The Living Smart neighborhood offers a community pool and spa, near Mammoth Highlands Park, and close to great schools, restaurants, shops, and freeways. Welcome home!